New York City FC followed up a 4-0 smashing of Real Salt Lake to register a 2-2 tie in Atlanta, with that result keeping those teams in the top two slots in Soccer America'sMLS Power Rankings. Sporting Kansas City held third by tying Seattle, 2-2, at home, and FC Dallas stayed unbeaten while rising to fourth with a 1-0 victory at New England. Both Los Angeles teams climbed a few notches by winning and a third straight victory for Orlando City moved the Lions into the top 10. 1. NEW YORK CITY FC (5-0-2), 1. A spectacular blast by Alexander Ring tied the game for a second time to earn a point in place where most visitors come away with only scorch marks. Substitute David Villa converted a penalty won by Jo Inge Berget after NYCFC sliced open AUFC in midfield. In midweek NYCFC obliterated RSL, 4-0, as Ismael Tajouri-Shradi scored his fourth MLS goal in five games. 2. ATLANTA UNITED (4-1-1), 2. Squandered a pair of one-goal leads provided by Miguel Almiron; his shot rebounded for Greg Garza to tap in and exquisite cross was headed home by Chris McCann. Debutant Ezequiel Barcoplayed the last 20 minutes, took one shot. 3. SPORTING KC (4-1-2), 3. Great goal by Graham Zusi re-tied the game five minutes after SKC had fallen behind, but what was keeper Tim Melia doing on the first Seattle goal? Costly glitches continue to plague what was the league’s best defense last year. 4. FC DALLAS (2-0-3), 7. FCD handled its first road game of the season very well: Jacori Hayes marked a strong showing by scoring the only goal, and keeper Jimmy Maurer (six saves) came to the rescue when needed. 5. LOS ANGELES FC (3-2-0), 8. Road wins are always important building blocks for expansion teams. A brilliant Carlos Vela strike into the top corner earned Marco Urena the first of his two assists and a solid performance front to back limited the ‘Caps to eight shots. 6. NY RED BULLS (3-2-0), 9. The first start for Alejandro Romero Gamarra (“Kaku”) chalked up three points. He scored the middle goal and helped direct an attack that landed 11 of 18 shots on target. 7. L. GALAXY (3-2-1), 10. The Ashley Cole-Zlatan Ibrahimovic combination struck again and the defense posted its second straight road shutout. Defender Daniel Steres preserved the zero with a vital tackle in the final minutes. 8. NEW ENGLAND (3-2-1), 4. Revs outshot FCD, 21-11, and controlled 62.5 percent of possession, but needed a pair of brilliant saves by Matt Turner just to stay in the game. 9. VANCOUVER (3-3-1), 5. Most of the ‘Caps forays were blunted before and after Vela’s golazo. 10. ORLANDO CITY (3-2-1), 19. The Lions are winners of three straight after scoring late first-half goals through Dom Dwyer and Chris Mueller to bag their first road victory of 2018. 11. COLORADO (2-1-2), 18. The Rapids rode the momentum of a first MLS goal for Jack Price (in the second minute) to knock off the defending champion. 12. COLUMBUS (3-3-1), 6. Stoned by one of their former own, goalkeeper Steve Clark, Crew SC piled up a 24-5 advantage in shots without failing to match the goal it conceded in the first minute. 13. HOUSTON (1-2-2), 14. A second-half rally led by Tomás Martinez (goal, assist) earned the Dynamo its second tie in as many road games this year. It was 1-9-7 on the road in 2017. 14. SAN JOSE (1-2-2), 15. The Quakes rallied with a late goal from substitute Jahmir Hyka, to get a point, but that occurred after they’d squandered a 1-0 lead at home. 15. TORONTO FC (1-3-0), 11. Three players debuted for the first team as a fatigued, shorthanded TFC tried to rally after falling behind early. 16. REAL SALT LAKE (2-3-1), 11. What was that? RSL was overrun after Luis Silva failed to score on a point-blank volley in the fourth minute. 17. PHILADELPHIA (1-2-2), 13. Union conjured up some good shots but were denied by a sharp goalkeeper. Three goals in five games so far and 1-1-2 at home. Ugh. 18. PORTLAND (1-3-2), 21. The Timbers rolled after a brilliant solo goal by Alvas Powell, who set up Diego Valeri for the game-winner three minutes later. A late own goal by Bill Poni Tuiloma frayed a few nerves down the stretch before Giovanni Savarese could celebrate his first MLS victory as a head coach. 19. MONTREAL (2-4-0), 16. A superb free kick by Jeisson Vargas increased his MLS take to three goals and tied the game, 1-1. Impact played five of its first six on the road; four of the next six are at Stade Saputo. 20. MINNESOTA UNITED (2-4-0), 17. The Loons gave it a good go in a tough venue, and debutant Darwin Quintero knifed through the opposition to handcuff the keeper with a low shot. 21. D.C. UNITED (1-3-2), 22. A goal in the first minute by Ulises Segura and some big saves by Clark generated a victory in the team’s MLS debut at Navy-Marines Corps Memorial Stadium in Annapolis, Md. The real home opener at Audi Field is still nearly three months away. 22. SEATTLE (0-3-1), 23. 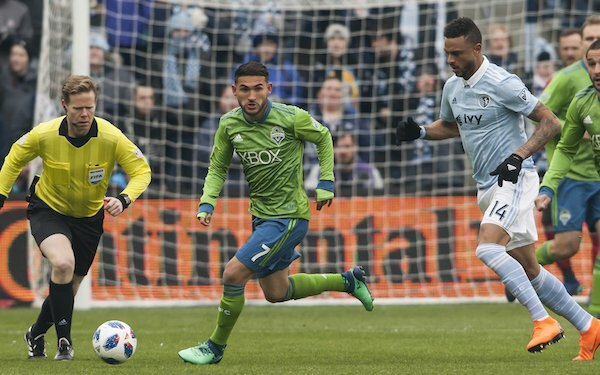 Pointless and goalless no more, the Sounders also welcomed back captain Osvaldo Alonso from an injury layoff dating back to the 2017 playoffs. Cristian Roldan drilled a laser into the bottom corner for a 2-1 lead that lasted only five minutes. Will Bruin scored the first goal and banged a shot off the crossbar before laying off a ball for Roldan to strike perfectly. 23. CHICAGO (1-3-1), 20. Homegrown signing Grant Lillard got his first MLS start and went the distance as the Fire lost at home for the second time in four games. He racked up a combined 20 blocks, clearances, interceptions, recoveries and tackles won.